Americans save for a better retirement. Saving for retirement should be as easy as 1, 2, 3.
iVEZT created the EZ IRA for business owners to offer their employees a hassle free savings plan. 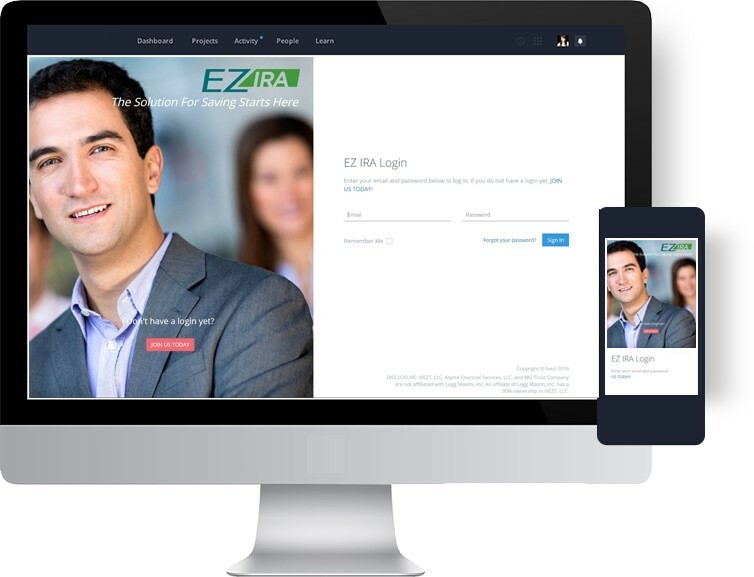 The EZ IRA allows employees to enroll online and fund their account through payroll deduction. Today's solution for tomorrow's retirees. of Americans aged 30-64 years old won't have enough for retirement and it is now a top financial priority. The EZ IRA is a cost-effective and seamless way for employees to achieve their financial goals through automatic payroll deduction. We have integrated with many leading payroll providers. How Does the EZ IRA Work? EZ IRA to their employees. The employee and the financial advisor determine financial goals. The employer transfers funds through payroll deduction. iVEZT, LLC, Aspire Financial Services, LLC and MG Trust Company are not affiliated with Legg Mason, Inc. An affiliate of Legg Mason, Inc. has a 30% ownership in iVEZT, LLC. We deliver unique products and services through insurance, financial and payroll professionals.